Your guide to serving up the best dish of the day! 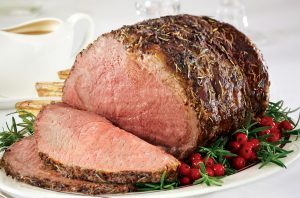 Our Prime Rib has been in high demand in recent years. It is a more expensive piece of meat but for smaller parties it is a special option. We carry it as Standing or Boneless and as Seasoned or Plain. This guide does not necessarily determine doneness. The best test is the temperature of the meat. Insert a meat thermometer in the center of the meat without touching the bone if there is one. Make sure the Prime Rib reaches 160 degrees for medium or 170 degrees for well done. When the correct internal temperature is reached, pull it out of the oven and let it rest for a few minutes before slicing. This allows the juices to settle and soak in.